Stay Safe! Georgetown ISD School Safety Program is provided for students and parents to anonymously report or notify school officials of situations that may pose a dange to our students or on our campus. Georgetown High School is home of the Eagles with colors of blue and white and “Eagle Fight Never Dies!” Originally constructed at 507 E. University Ave (Click here for historical marker information) near downtown Georgetown in 1923-1924 at what is now home of GISD Administration and Hammerlun Center for Leadership and Learning, Georgetown High School is now prominently located at 2211. Austin Ave. GHS serves students in grades 9-12 and offers a full spectrum of state and federal programming, academic as well as extracurricular experiences. At Georgetown High School, we aspire to become home of the most inspired learners served by the most empowered leaders. In this venture we will focus our efforts on designing engaging learning experiences, modeling and fostering respectful relationships and by building and developing the skills and attributes of the GISD Learner Profile. Georgetown High School is proud of its rich tradition of excellence and years of success in all programs and clubs. Students have opportunities to lead, grow and serve in fine arts, athletics, academics, industry level courses as well as innovative clubs in cyber security and 3D modeling. GHS is home to the Eagle Innovation Center fully equipped with state of the art machines and equipment to help any Eagle’s dreams become reality. 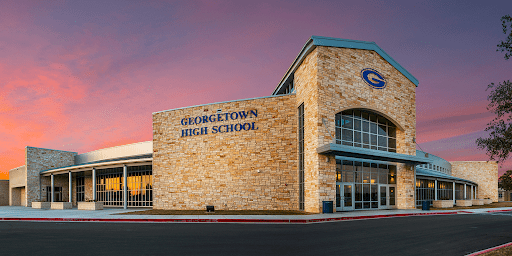 At Georgetown High School we recognize that our community is such an integral part of our success and our role of preparing our students for their futures. Please take our website for a spin as you get to know GHS a little better. We invite anyone interested in knowing more about GHS to contact us at the information found below as we look forward to expanding our partnerships with our community. Thanks for visiting and remember, Eagle Fight Never Dies!